A solemn corner of letters in the Cathedral of St. John the Divine. 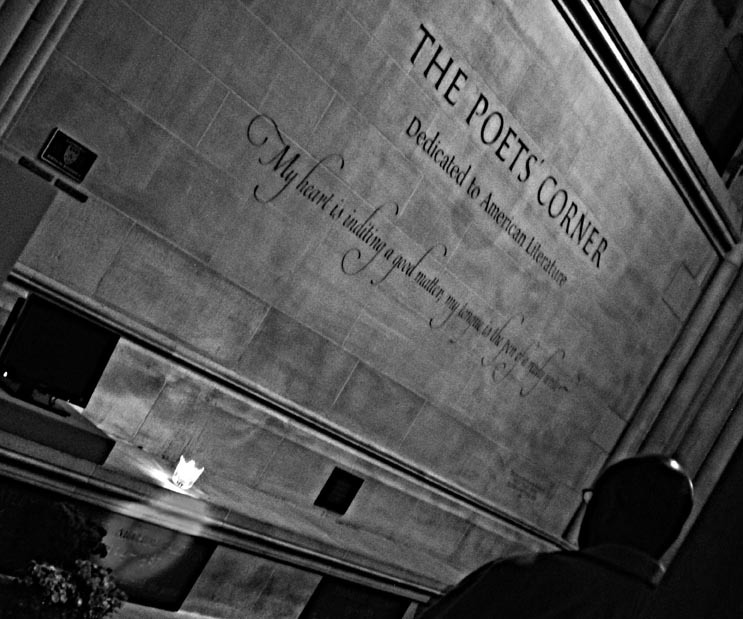 James Arthur Baldwin was inducted into the American Poets' Corner on November 6, 2011 becoming the 44th inductee. While it is true that Baldwin wrote one volume of poetry — Jimmy's Blues — he is better known as an essayist in the tradition of Thoreau and Emerson. Baldwin's essays reached novel length. In Notes of a Native Son, (1955) Baldwin not only borrows Richard Wright's famous title, he challenged a generation to re-think how they looked at America and how they looked at themselves. This collection of essays that he began to write while living in Greenwich Village as a 17 year-old young man during the early days of world war II would be published on the heels of his critically acclaimed first novel, Go Tell It on the Mountain (1953). A veiled accounting of his difficult childhood growing up in Harlem, Go Tell It on the Mountain was written by Baldwin in the years after he settled in Paris in 1948 to escape the nascent racism of America. In Paris he felt that he would be judged by the merit of his writing and not the color of his skin. It was that absence of skin color in James Baldwin's second novel, Giovanni's Room, published in 1956, that earned him the scorn of some stateside critics. Giovanni's Room was one of the first popular novels with openly gay characters and dealt with identity and love. Not willing to be defined, pigeonholed or labelled, Baldwin's next two novels, Another Country and Tell Me How Long the Train's Been Gone, are explorations of the outrage and times that were the 1960s in America. Baldwin's characters, be they black, white, gay or heterosexual dealt with difficult times and civil unrest. His essay Down at the Cross put him in the cross-hairs of the civil rights movement as he discussed faith in the African-American community. His thoughts on the pull of Christianity which he was brought up with against the burgeoning Black Muslim movement that are articulately captured in Down at the Cross placed him on the cover of Time magazine. Baldwin returned to France following the assassination of Martin Luther King Jr. where he continued to write discourses and novels that challenged readers and society while deftly defying labels from his critics until his death. In 1974, Baldwin returned to his native New York to receive the Centennial Award in recognition of The Artist as Prophet from the Cathedral of St. John the Divine joining Tennessee Williams, Martha Graham and Buckminster Fuller as recipients. The Cathedral of St John the Divine is also home to the American Poets' Corner and is where Baldwin's funeral was held in December, 1987. It is fitting that the son of a preacher man, who explored, questioned and challenged faith and ideas be enshrined in the Cathedral of St. John the Divine. To be honored in the American Poets' Corner. To be among the giants of American letters. To be alongside his favorite American writer in Henry James. To stand with the great essayists, Thoreau and Emerson.